Dating apps could help some users find true love by matching their preferences, hobbies, etc. Now Samsung has come up with a completely new way to find a date. The Korean firm has launched a Tinder-like dating feature called Refrigerdating. It uses the content inside your fridge to help you find potential matches. Samsung’s dating feature works with the company’s Family Hub Refrigerator. The $4,000 appliance features a big touchscreen on the door and an ingredient-tracking camera to help keep track of essential items like milk. 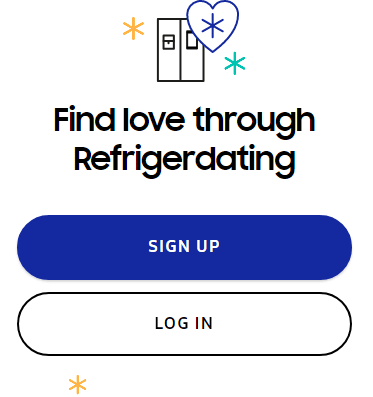 To use the refrigerator’s dating feature, users must take a picture of what’s inside their fridge and then upload it to the Refrigerdating website. Users also need to add a short bio and a way for potential dates to contact them, like a phone number, email, or other contact information. Users will then get access to fridge photos uploaded by others, and they can either select “Not to My Taste” or “Let’s Get Cooking.” The app works like the Tinder dating app by allowing users to swipe right or left to scan through the contents inside other users’ refrigerators. If you find anyone of interest, you can contact them directly. Users who don’t have a Family Hub Refrigerator can take a photo with their phones. Samsung’s Refrigerdating feature is currently accessible only via web browser. There is no mobile version of the app. The idea for the Refrigerdating feature is based on the premise that what you eat says a lot about who you are, whether it’s leftovers from last night’s dinner or the ingredients for some fancy dish. Moreover, it tries to play off the age-old proverb that the way to a man’s heart is through his stomach. “We hope people can meet under more honest or transparent circumstances with the help of the contents of the fridge, because that can tell you a lot about the personality,” a Samsung Sweden executive said, according to CNET. The idea originated from Sweden, a country with a large population of single people. However, the Refrigerdating feature is available globally. According to data from Eurostat, almost half of all households in Sweden consist of single adults without kids. As far as why Samsung adopted the swiping function, developer Peter Simonsson said they thought it would be the best way to interact with the feature because many users are already familiar with it thanks to dating apps like Bumble and Tinder. In addition to the Refrigerdating app, the Samsung Family Hub Refrigerator supports several other apps. Through these other apps, the fridge’s giant screen can be used as a music player, family notice board, calendar and even a television. Additionally, using a combination of cameras and apps, the screen can provide you a constant video stream of your home. All of it can be managed with Samsung’s digital assistant Bixby. Will Samsung’s dating app attract users? Online dating is a growing category, and Samsung apparently wants to capture a piece of it. Over 90% of the 54.3 million singles in the U.S. have tried to find a date online, according to the Statistic Brain Research Institute. Niche dating sites like those based on political views, religious beliefs and other ideas are also attracting users. Thus, Samsung’s Refrigerdating feature based on food preferences definitely stands a chance. Since Valentine’s Day is just around the corner, it should be a good time to roll it out. “Food is really a part of our lifestyle these days, and there are so many nuances of diet — there are people who are gluten-free or vegan — and often [they’re] most understood by someone who also has that diet,” online dating coach and author of the book Love @ First Click Laurie Davis said, according to CNET. So what’s in it for Samsung? The Korean firm will get a look at what is in your fridge, enabling it to collect data on what you are buying. Since the feature is available through a browser, anyone with access to the internet can use it. The Korean firm didn’t reveal how many people are using it, but it did say people are signing up. Samsung said it coordinated with a relationship expert to create the Refrigerdating app. The company also recommends not decorating the fridge with food to attract dates. Rather it tells users to be themselves because this is what should help them find the right partner.